Transition words and phrases sew our writing together with an easy flow. Teaching this tactic to young students sets them up for a lifetime of clear and cohesive writing. So, if you're looking for some practice with elementary school transition words and phrases, you're in the right place. Let's start off by examining a definition of transition words. Then, we'll explore some examples and word lists, and finish with a practice worksheet. I saw the dog. Then, I pet the dog. Then, he ran away. Then, I went home. I saw a dog and then began to pet him. Soon, he ran away, so I went home. This bit of text was improved by putting short sentences together and using transition words. 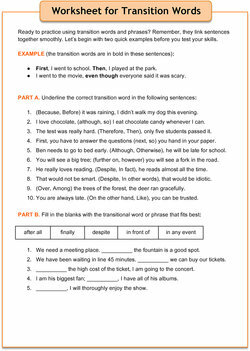 If you're working with second graders, in addition to the worksheet below, try the activity and worksheet in Transition Words for Second Grade with your students. Ready to practice using transition words and phrases? Remember, they link sentences together smoothly. Read through the questions below or download and print the worksheet as a PDF. First, I went to school. Then, I played at the park. I went to the movie, even though everyone said it was scary. (Because, Before) it was raining, I didn't walk my dog this evening. I love chocolate, (although, so) I eat chocolate candy whenever I can. The test was really hard. (Therefore, Then), only five students passed it. First, you have to answer the questions (next, so) you hand in your paper. Ben needs to go to bed early. (Although, Otherwise), he will be late for school. You will see a big tree; (further on, however) you will see a fork in the road. He really loves reading. (Despite, In fact), he reads almost all the time. That would not be smart. (Despite, In other words), that would be idiotic. (Over, Among) the trees of the forest, the deer ran gracefully. You are always late. (On the other hand, Like), you can be trusted. Part B. Fill in the blanks with the transitional word or phrase that fits best: after all, finally, despite, in front of, in any event. We need a meeting place. __________ the fountain is a good spot. We have been waiting in line 45 minutes. __________ we can buy our tickets. __________ the high cost of the ticket, I am going to the concert. I am his biggest fan; __________, I have all of his albums. __________, I will thoroughly enjoy the show. "Elementary School Transition Words and Phrases." YourDictionary, n.d. Web. 24 April 2019. 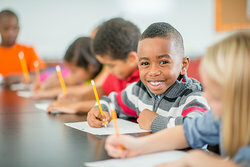 <https://education.yourdictionary.com/for-teachers/elementary-school-transition-words-and-phrases.html>. Transition words and phrases sew our writing together with an easy flow. Teaching this tactic to young students sets them up for a lifetime of clear and cohesive writing. So, if you’re looking for some practice with elementary school transition words and phrases, you’re in the right place.Let’s start off by examining a definition of transition words. Then, we’ll explore some examples and word lists, and finish with a practice worksheet.